If i recall correctly, in previous version I used to be able to drag folders from my windows explorer to PM. Now I can’t anymore, (on 2 computers with latest version) and have to right click, choose add folder etc. pretty annoying. Could it be a .net framework 4.6 problem in windows 10 maybe? Also, when I drag a hdri into the viewport, the hdri is only added to the environment slot. didn’t pm also used to create a vray dome light with the associated hdri, or wasn’t this the case? Thanks for your feedback and wishes. …able to drag folders from my windows explorer to PM. But i can’t reproduce this issue. Are you tried drag a folder from network or local path? Whereto did you drag it? To treeview panel, to another directory, to catalog or to favorites folder? 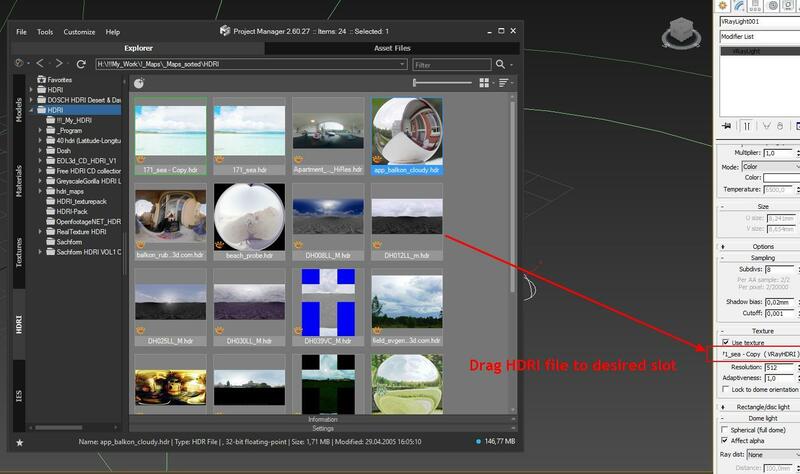 Maybe you want what hdri also assign to Vray render reflect/refract slot? You can simple assign HDRI to desired slot of Vray Light by dragging.